Forget what the Fox Says – the real mystery of the forest is what the lynx says. 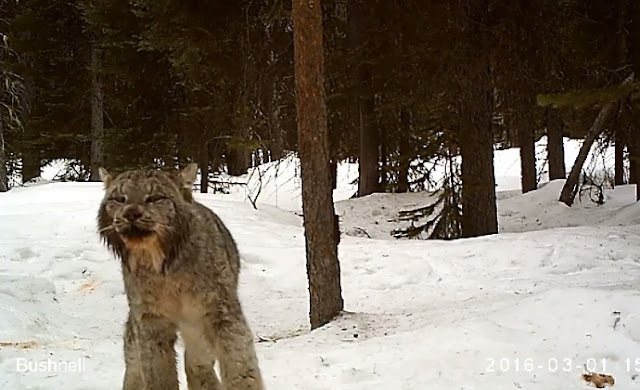 In a trail cam video captured by Swan Valley Connections, a conservation and education organization based in Montana, a rare lynx walked into view and stood for a moment. This footage was captured this winter as Swan Valley Connections, the Blackfoot Challenge, and the Forest Service work together to monitor rare carnivores for the Southwestern Crown Collaborative. The Canada lynx (Lynx canadensis) or Canadian lynx is a North American mammal of the cat family, Felidae. With the recognised subspecies, it ranges across Canada and into Alaska as well as some parts of the northern United States and extending down the Rocky Mountains to Colorado, where they were reintroduced in the 1990s. With a dense silvery-brown coat, ruffed face and tufted ears, the Canada lynx resembles the other species of the mid-sized Lynx genus. It is slightly larger than the bobcat, with which it shares parts of its range, and over twice the size of the domestic cat. Responses to "Rare and awesome footage of a Canada lynx vocalizing in the wild"